Directions (1 – 5): In the following questions, only one Conclusion is given and five statements are given as a), b), c), d) and e). From this you have to take the statements to be true even if they seem to be at variance with commonly known facts and then decide which of the given statement logically follows. b) Statements: All chains are cycles. No cycles are bikes. 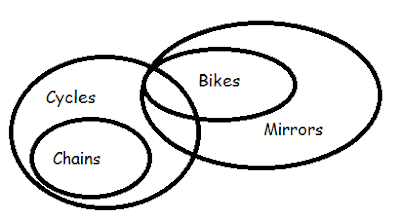 All bikes are mirrors. Direction (6 – 10): In the following questions, only one Conclusion is given and five statements are given as a), b), c), d) and e). From this you have to take the statements to be true even if they seem to be at variance with commonly known facts and then decide which of the given statement logically follows. a) Statements: Some stores are roads. Some roads are houses. Some houses are streets. a) Statements: No guides are papers. All papers are books. Some books are files. b) Statements: Some guides are papers. All papers are books. Some books are files. 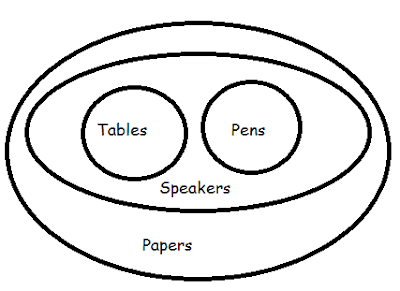 d) Statements: Some guides are not papers. All papers are books. Some books are not files.